A store worker was shot by a would-be robber on a busy store-lined avenue in Queens Wednesday evening, law enforcement sources said. 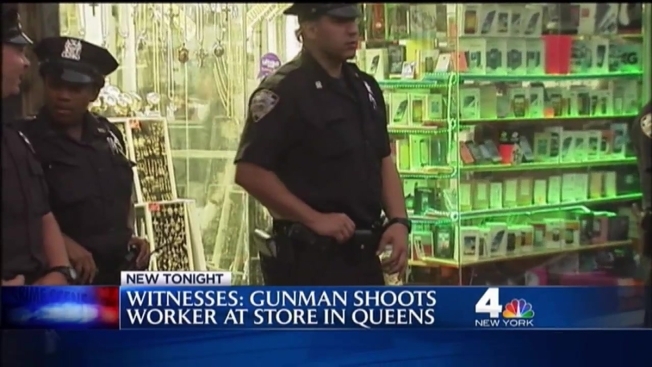 It happened at a variety store on Jamaica Avenue in Jamaica, the sources said. A 21-year-old man walked into the business intending to rob it and got into a fight with the worker. One witness who did not want to be identified said, "A whole fight broke out and in the midst of two guys fighting, one of them shot the other, and they were still continuing to fight. He didn't even know he was shot." The worker was shot in the armpit area. Witnesses said bystanders inside the store chased after the suspect and held him outside the store until police arrived. Cellphone video shows officers swarming the street as they close in on the suspect. The suspect is being held at the precinct station. Charges are pending.